Just this week Facebook released tips and techniques to manage the new Live Feature available on the social platform. Whether you are uploading a simple image or going Live, managing what is shared on your page will help keep your brand consistent. Check out these useful insights when going Live on Facebook! A filter has been added to the video library feature to help you quickly and easily find Live videos. Click the “Advanced” button under filters. Note: Live videos have a red icon next to them when they are currently live and a grey icon when they were recorded live but are now VOD. Use the filter mentioned above to find Live videos and retrieve real-time data. A chart will appear once you find and click the video. This data tells you tell you the peak viewership and number of viewers at each individual moment of the video. When new social media sharing features are available it is important to not only utilize them, but to properly manage and track for data. Be successful in your social media campaigns by staying consistent and current with trends and techniques. 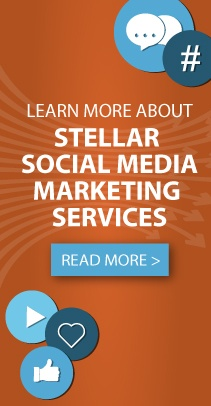 Contact Stellar Blue to successfully utilize this and other social media features right away and take your digital marketing strategy to the next level!